For many years, there has been much speculation that John Lennon‘s wife, Yoko Ono, influenced the Beatles breakup, but Paul McCartney says that it’s not true and that the band was splitting regardless of Ono. Classic Rock magazine reports that McCartney shares his feelings on the subject in a new interview with Sir David Frost that will be broadcast on Al Jazeera next month to celebrate his 70th birthday. 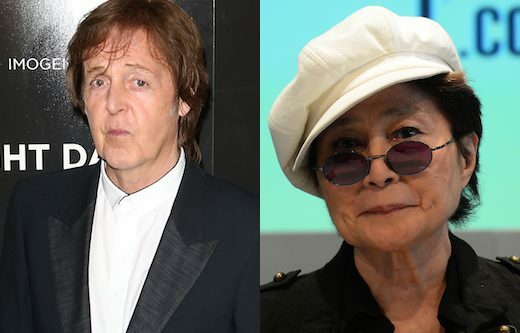 McCartney says, “When Yoko came along, part of her attraction was her avant-garde side, her view of things. Speaking of bodies of work, McCartney is increasingly adding to his. The singer has his ‘Live Kisses‘ DVD, which features his take on several standards, arriving on Nov. 13. He’s also covered ‘The Christmas Song‘ for Starbucks latest compilation, ‘Holidays Rule,’ which is in outlets tomorrow. Plus, there’s word that McCartney may have two albums currently in the works.